On many places you can find a mixture of an European and eastern, Jewish food. Especially close to the Jewish district there are some restaurants spezialised on jewish food. There is a restaurant chain called Hummus bar where you can taste delicious fallafel, hummus and pita bread. You can find about ten Hummus bars in Budapest. Another jewish restaurant is Mazel Tov. It is situated into a coutryard which is decorated with lights and plants. It is covered with a roof but in summer the space is open air. 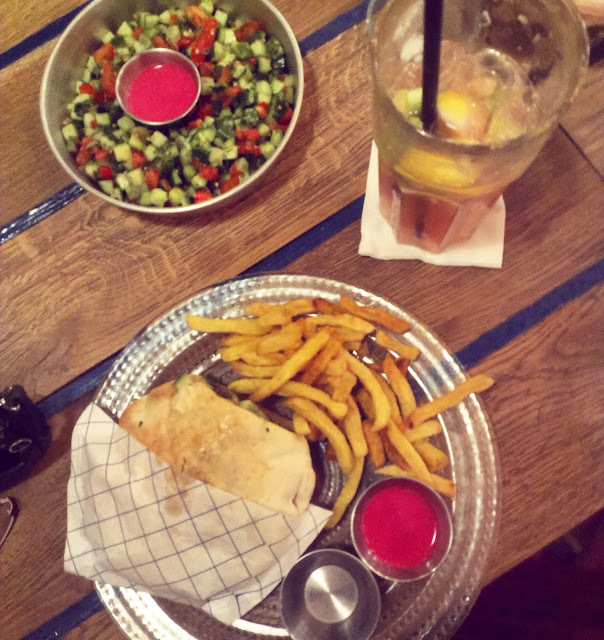 The menu is full of delicious food like stuffed pita sendwiches, salads, hummus and meet. The atmosphere is really nice especially in evenings. My favourite café so far is the Café Konyha (which means kitchen in hungarian). They have the best coffee and also nice desserts. It is located close to the Király street in a district with another cafés, little art galleries and fashion shops. You can sit outside at Konyha or choose a cozy place in the upper floor. And what is this blog about? "Travel is the only thing you can spend money on that will make you richer."